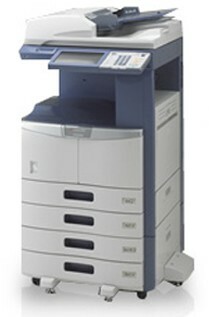 Toshiba has launched 9 new B&W MFP in June in the USA. Those models are printing from 20 ppm to 85 ppm. Some news regarding the last version of the range : they offer now a colour touch screen LCD control panel. Moreover those MFP can scan in colour. Here are all the denominations for those machines : e-Studio 205L, 255, 305, 355, 455, 555, 655, 755 et 855. We will give you more informations as soon as they will be launched on European market.